For other versions of this character, see Mizar (disambiguation). Yu-Gi-Oh! ZEXAL episode 73: "Kite's Plight: Part 2"
Mizar, known as Mizael in the Japanese version, is a Barian Emperor appearing in the Yu-Gi-Oh! 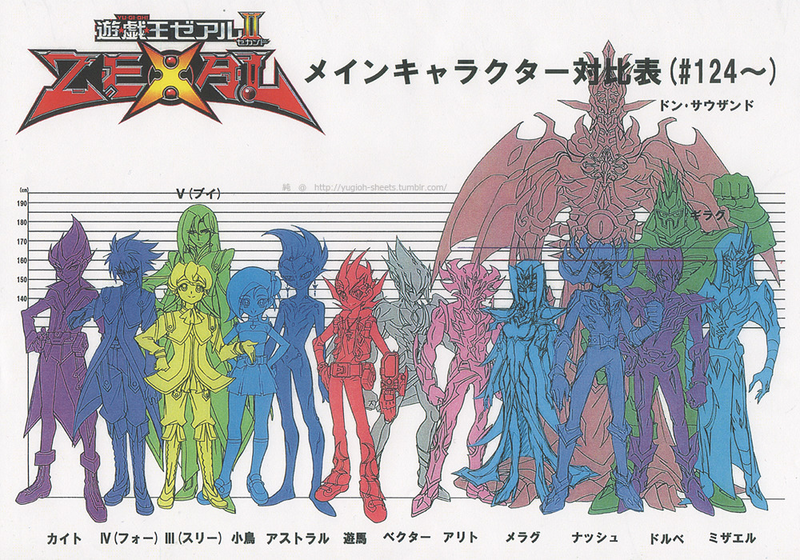 ZEXAL anime  who is working to gather the "Numbers" to save the Barian World. He was eventually defeated in a Duel and his soul was absorbed by Don Thousand. After Yuma Tsukumo's and Astral's final Duel, Mizar was revived by the power of the Numeron Code. Full view of Mizar's true form. While in his true form, Mizar has a decidedly alien mask-like face with a wing prodding out the left side, and piercing blue eyes, similar to Vetrix. He wears a bronze-colored sarong in addition to having yellow skin, horned shoulders, and long blond-orange hair. He also wears his Barian Emblem hanging from his chest in the shape of a caduceus. He is also the second tallest of the Emperors after Girag. Full view of Mizar's human form. In his human form, Mizar's hair is lighter and has his wing-shaped extension as a part of his hair. He also wears a long golden earring on the left side of his hair, attached to a smaller wing. He also has red markings on his cheeks and above his eyes. Unlike Girag and Alito, Mizar does not wear a school uniform; he instead wears white pants and a white, long-sleeved shirt underneath a gray vest with long gray gloves, both of which have wings. Following his revival after Yuma Tsukumo and Astral's ceremonial Duel, Mizar attends Heartland Academy as a third-year student, thus wearing the standard blue-lined uniform, blue pants and brown shoes. In his past life, he lacked his facial marks and has a golden necklace, a large gold shoulder plate on his left shoulder with a golden gauntlet, a golden wing-shaped armband on his right arm, white robes underneath with a diamond pattern on the left side of the torso and golden stripes on the other and was tied with a green sash at the midsection. Mizar also carried a sword. Mizar is prideful and arrogant as being a "Galaxy-Eyes" master, shown when he obtained his Over-Hundred Number through a blank card, despite the monster's tremendous power. Due to this he eventually develops a rivalry with Kite Tenjo, being the only other known "Galaxy-Eyes" master in order to prove who is the superior. Unlike Girag and Alito, Mizar is shown to be straightforward and serious, as when he arrived on Earth, he began his mission right away - giving Girag and Alito their Barian Sphere Cubes, and then moving on to find Yuma Tsukumo - whereas the other two remained distracted with their antics, to which he chastises the two for letting them get in the way of their goal. However, he seems to enjoy showcasing his powers, as Alito stated his entrance was "overly flashy". However, his pride has shown to be somewhat fragile, as he was extremely furious at Trey and Quinton for stealing his "Number 107: Galaxy-Eyes Tachyon Dragon" and blocking his attempt to summon its upgraded form, clenching his fists while claiming it was the first time that he had received such an insult and berating the siblings. He is also somewhat hasty when he is angered, as shown when he used Chaos Draw to draw "Rank-Up-Magic - The Seventh One", before realizing it was useless to him in his current situation. Due to his arrogance, Mizar is shown to be obstinate at times, as he refused to believe from both Dumon and Jinlon that he and his comrades were humans once, although this subsides if evidence is given against him. He was also somewhat reluctant to abandon his second Duel with Kite when the power released by ZEXAL II damaged Sargasso. In his final Duel against Kite, he stubbornly refused to believe that his "Tachyon Dragon" was part of a curse created by Don Thousand, and that his dragon would not betray him. In spite of his arrogance, Mizar does show a level of concern and respect for his fellow Barians, as revealed when he saw Alito injured. He showed much anger and hatred towards Vector for his mocking of Alito and Girag and had to be physically restrained by Dumon to prevent him from attacking Vector. He also maintains a strong sense of honor, much like Alito, refusing to use "Sargasso Lighthouse" in his rematch with Kite, calling it a "coward's card". In his past life, he was fiercely loyal and held a strong friendship with his dragon. Mizar has also displayed a degree of respect and mercy for his foes as he allowed Quinton and Trey to say their goodbyes to Yuma before defeating them and sending them to the Barian World, referring to them as "proud brothers". Likewise he also mourned Kite's death at the end of their final Duel despite their fierce, bitter rivalry. Mizar firing an energy ball at Tori. Mizar can control Tachyon Dragon, something that other Barians fear him for. Using a blank card, he can even absorb it in order to use it in Duels. He is capable of teleportation via portals just like other Barians. Furthermore, he can produce energy balls to use as weapons, though they do not cause permanent harm. Like Vector, he was shown to be able to generate energy waves in order to push other people back. He can also create a barrier that can protect him from harm, as seen when Anna fired her cannon at him. He's also shown to be athletic enough to jump from building to building, being capable of easily following a vehicle in movement. He can surround his entire body with a golden aura that protects him from the vacuum of space, allowing him to face Kite on the moon. Mizar is named after Zeta Ursae Majoris, also known as Mizar, a star located in the Big Dipper asterism. His name in the Japanese version is a corrupted form of that star's name. Mizar in his past life, with his dragon. When Mizar was a young child, raiders attacked his village and killed everyone, including his parents, (in the dub, they were kidnapped) but he was able to run away. He eventually ended up in a desert where he was on the verge of dying until Jinlon rescued him. The two formed a strong bond. He also obtained "Number 46: Dragluon" as a result of his bonds with his dragon. Since then, Mizar became a mighty dragon tamer who protected his land alongside Jinlon. When a secret agent posing as a wandering shaman blamed the dragon for a deluge that flooded the village, Mizar defended him from the rioting villagers and even offered his life so the villagers would believe him. They were then ambushed by a neighboring army, which killed Mizar and Jinlon and took over the land. While he lay dying the wandering shaman, revealed to be Don Thousand, appeared, stating he could not let his dragon soul go to the Astral World. Thousand embedded "Number 107: Galaxy-Eyes Tachyon Dragon" in Mizar's heart and filled it with hatred, (In the English Dub, Don Thousand also falsified his memories, making him believed that he betrayed Jinlin and was the cause of his death). Mizar along with Dumon, Alito and Girag. Mizar was reincarnated as one of the Seven Barian Emperors, as his soul was one that was connected to a Mythyrian "Number" card, which had sealed Thousand's power. Mizar had no memory of his previous life, due to the "Over-Hundred Number" that he received from Don Thousand. The Emperors plotted to destroy the Astral World. Due to both worlds being made of energy, they could not interact. As Barians cannot take "Numbers" directly, they exploited humans such as Vetrix and Dr. Faker. Mizar receiving the Barian Sphere Cubes. After Dumon sent Alito to Earth, Mizar questioned whether Alito was really capable. He insisted that if they cannot defeat Yuma Tsukumo and obtain the "Numbers", the Barian World has no future. He was perplexed how Dumon could entrust such a mission to a "simpleton" like Alito. Dumon responded that putting aside everything else about him, Alito was a reliable Duelist and even if he failed, his failure would still bring them more information. After the constant failures of Girag and Alito, Dumon decided to send Mizar to Earth in order to Duel Yuma. He gave Mizar three Barian Sphere Cubes, two of which he was to give to Girag and Alito. He then disappeared into a portal and appeared in an unknown realm and approached a giant dragon which he absorbed into a blank card. He then went to Earth, creating storms in the process. Seeing this, Girag and Alito investigated and recognized Mizar straight away as he emerged from the crater he created upon impact. Mizar gave the two their Barian Sphere Cubes, then disappeared before they had a chance to talk. Mizar spied on Yuma and Tori near the Duel Sanctuary and fired an energy ball at Tori, knocking her over. He then activated his Barian Sphere Cube, forcing Yuma into a Duel with his "Numbers" on the line. Yuma managed to get a head start by Xyz Summoning his "Number 39: Utopia" but Mizar countered with "Number 107: Galaxy-Eyes Tachyon Dragon". Mizar Summoning "Neo Galaxy-Eyes Tachyon Dragon". Mizar ordered his "Tachyon Dragon" to attack "Utopia", negating its effect in the process, which resulted in its destruction. The force of the attack sent Yuma flying into the Barian Sphere Cube, with him falling unconscious due to the blow. As this occurred, Kite appeared with Orbital 7, challenging Mizar to a Duel between "Galaxy-Eyes" users which Mizar accepted. After Kite Xyz Summoned "Neo Galaxy-Eyes Photon Dragon" and destroyed "Tachyon Dragon", Mizar shed his human disguise, revealing his true form. He then Xyz Summoned his "Number C" through the use of "Rank-Up-Magic Barian's Force", resulting in "Number C107: Neo Galaxy-Eyes Tachyon Dragon". However, due to the sheer power of the monster, the Duel was interrupted as the Barian Sphere began to collapse under the pressure the monster generated. Mizar then returned to his human disguise and told Kite that he will be the one to control both "Galaxy-Eyes" monsters, and then retreated. Mizar attempting to attack Vector. After Alito was injured by Ray Shadows, Girag called Mizar to find out who attacked him. Mizar suggested it had to do with Yuma Tsukumo. Girag wanted to take revenge on "Ray", but Mizar did not support this, pointing out that they have only one remaining Barian's Sphere Cube and they must use it to obtain Yuma's "Numbers". He then departed with Alito to the Barian World for help through a portal. After Yuma and "Ray" defeated Girag, Mizar and Dumon were surprised when Vector appeared, as they thought he was killed when Dr. Faker was defeated. When Vector joked about how Alito and Girag lost, Mizar became angered and tried to attack him, but was stopped by Dumon. The three discussed what to do next about Yuma and their hunt for the "Numbers", and Mizar ultimately agreed to let Vector handle Yuma for now. Vector's plan eventually resulted in Yuma, Astral and their allies boarding the Different Dimension Airship and attempting to reach the Barian World to rescue Ray. The Barians sent monsters after the ship, and though the occupants fought them off, the ship crashed at "Sargasso the Different Dimension Battlefield", where Mizar waited with Vector and Dumon. Mizar Dueled Kite again and allowed him the first turn, and watched Kite take damage from the effect of "Sargasso" when he Summoned "Starliege Lord Galaxion". Kite proceeded to Summon "Galaxy-Eyes Phpton Dragon", but Mizar refused to give himself an advantage by using "Sargasso Lighthouse" like Dumon and Vector, calling it a "coward's card". When Mizar Summoned "Tachyon Dragon", he took damage from "Sargasso" as a result. When Kite Summoned "Neo Photon", Mizar activated "Neutrino Dowsing" to send "Rank-Up-Magic Barian's Force" from his Deck to the Graveyard and use its effect to Summon "Neo Tachyon". After the power surge of ZEXAL II caused "Sargasso" to self-destruct, Mizar was ordered by Dumon to stop his Duel and retreat. Mizar initially objected to this, but as his platform began to crumble, he complied and left the field. Mizar and Dumon returned to the Barian World to find it crumbling around them and took it as a sign that their time was ending. Vector reappeared and they blamed him for the failure of their previous plans, with Vector retorting that without those plans, they would be even worse off. This enraged Mizar, saying the Vector will face his "Galaxy-Eyes" wrath, but Dumon stopped him from attacking Vector. Vector told them that Astral's powers are increasing - if he recovered his memories, the Barian World would be finished; after all, he defeated Don Thousand years ago. Vector told them of the Mythyrian "Numbers" hidden on Earth and suggested they take them before Yuma does, while introducing Mr. Heartland. Heartland had been turned into to a fly, but told them of information he gleaned while working for Dr. Faker - the twenty-three locations on Earth where portals to other dimensions can appear. Mizar and Dumon agreed to search for them and immediately departed. Later, Vector called Mizar and Dumon back to the Barian World and informed them that Alito and Girag had awoken, much to their surprise. Mizar was angered by Alito's arrogant attitude towards him, but their conversation was cut off when Mr. Heartland interrupted them, revealing the next "Number" location and that Yuma might be aiming for it as well. Mizar looked on as Alito left to retrieve it. Mizar arrives at the fourth set of ruins. Later, Mizar reported to Dumon that he had located another Number ruins and noticed that Dumon seems distracted by something. When Mizar questioned him, Dumon shared his theory that the Barians had once lived as humans, but Mizar rejected the theory and departed for the ruins he had just located. Upon arriving, Mizar heard the roar of a dragon that he apparently recognized. After Kite won his Duel against Jinlon, Mizar secretly listened to the legend of the ruins that included him. Unable to accept that he was once a "lowly human", he attacked his former dragon partner and challenged Kite to settle things. Unfortunately, the force of the "Neo Galaxy-Eyes" monsters began to destroy the ruins, so Mizar decided to retreat, swearing to defeat Kite and his new dragon. Later, Mizar met with Dumon on Earth, who asked him if Jinlon said that he used to be human. Mizar confirmed that he did, but that he had no intentions of believing it as he is a proud Barian warrior. Dumon claimed he felt the same, but decided to continue to check up on the ruins, hoping to find the legends of Nash and Marin, as finding them could shift the situation to the Barians' advantage. In the Barian World, Mizar spoke to Dumon once again about the ruins and came to terms with the fact that the Barians were once humans. When Dumon announced that he was going to get Nash and Marin by the ruins' legends, Mizar was baffled that they could be Shark and Rio Kastle. Later, Mizar was called to an emergency meeting between the Seven Barian Emperors. There, he witnessed Vector discover that Nash and Marin were still alive. Nash granted each of the Barian Emperors new powers, then consented to Vector's plan of attacking Earth now. Mizar Duels Anna and Nelson. 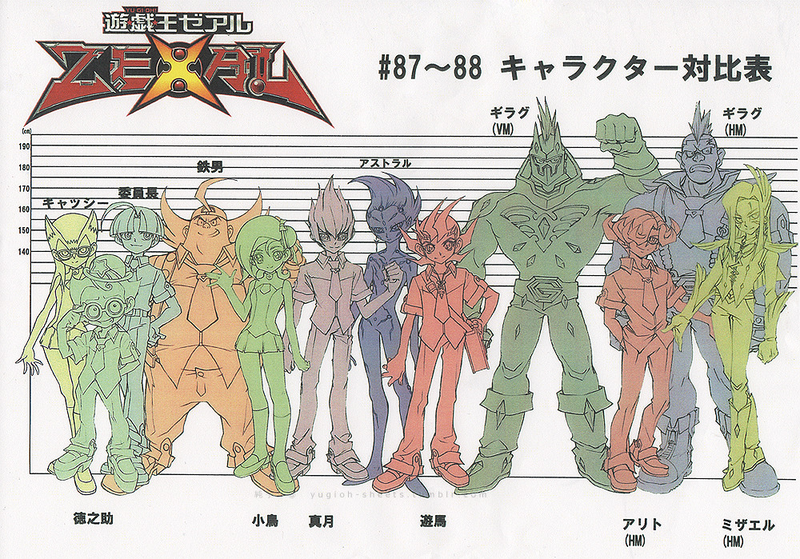 After Mr. Heartland was defeated, the Seven Barian Emperors arrived together on Earth in front of Yuma. Together, they Barian Battlemorphed. Yuma was rendered unable to Duel when the Emperor's Key reacted with Nash's Barian Emblem. Roku and Kaze arrived and pelted the Emperors with smoke bombs, allowing Yuma's group to escape. The Emperors gave chase, with Mizar being attacked by Anna Kaboom, shot by her cannon. He blocked the blow, with Anna telling him she won't let him lay a finger on Yuma no matter what. Mizar responded that he won't forgive anyone that gets in his way. Anna claimed that unforgiveness was her line, but was interpreted by another figure saying the same thing. It was Nelson Andrews still acting in his Star Sparrow persona, saying it was time for another "grand feast of justice". The two joined together to confront Mizar. Later in the Duel, Mizar performed a Chaos Draw alongside the other Emperors. This allowed him to use "Rank-Up-Magic - The Seventh One" to bring out "Number C107: Neo Galaxy-Eyes Tachyon Dragon" and defeat both of his opponents. As their souls departed for the Barian World, he simply said "farewell". After Nash's victory over Quattro, the Emperors regrouped and Nash ordered them to split up and pursue the remaining "Number" holders - Yuma, Astral, Kite, Trey and Quinton. Mizar went after Yuma and Astral, only to find his way blocked by Trey and Quinton, who refused to divulge their whereabouts, saying he'd have to defeat them first. He asked if they wished to become prey for his "Neo Tachyon", but they still refused to move and Mizar prepared to Duel them. Mizar cannot play "Rank-Up-Magic - The Seventh One". Quinton informed Mizar that he had been the one who taught Kite how to Duel, which seemed to intrigue him. Quinton Summoned "Number 9: Dyson Sphere", whose size alerted Marin and Dumon to the Duel's start. The two quickly made their way there, but Mizar told them he was fine and that they should go search for Yuma and Kite instead. Quinton and Trey used the power of the bracelets' crests to generate a Sphere Field, which trapped the three Barians there. Mizar insisted his allies still not interfere and quickly brought out "Number 107: Galaxy-Eyes Tachyon Dragon", but was unable to Rank it Up due to Quinton's "Spell Summon Stopper". Although "Tachyon Dragon" destroyed "Dyson Sphere", Mizar played into his opponents' hands with "Tachyon Flare Wing", ultimately resulting in "Tachyon Dragon" being equipped to Trey's "Number C6: Chronomaly Chaos Atlandis". Mizar called this the first time he had been humiliated and used "Chaos Draw" to draw "The Seventh One". He intended to Rank-Up "Tachyon Dragon", but quickly realized he could not, as it was not on his field or in his Graveyard or Extra Deck, but equipped to his opponent's monster. Admitting he had underestimated them, he played defensively using "Heliosphere Dragon" and two Trap Cards. This was enough to survive Quinton's combo of "Chaos Atlandis" and "Number C9: Chaos Dyson Sphere", though his Life Points remaining at only 1. He also recovered "Tachyon Dragon" this way, enabling him to Summon "Neo Tachyon". Despite Quinton's and Trey's own Trap Cards, the effect of "Neo Tachyon" rewound time and rendered them useless. Seeing there was no way out, Quinton activated a communications link with Yuma and told both him and Mizar where Kite had gone. He had discovered a tablet detailing a legend regarding the "Galaxy-Eyes" dragons. Believing them connected to the Numeron Code, he journeyed to the moon. After allowing Trey and Quinton to say their good-byes to Yuma, Mizar ordered his attacks, defeating the brothers and sending them to the Barian World, saying "farewell, proud brothers." After conversing with Dumon and Marin, Mizar made for the moon himself..
Mizar obtains "Number 100: Numeron Dragon". When Mizar arrived on the moon, he had a conversation with Kite, who revealed the origin of the "Galaxy-Eyes" and their connection to the Numeron Code to him. After the conversation, Mizar commenced Barian Battlemorph and challenged Kite to a Duel to prove himself as "the strongest Dragon Master". After "Neo Tachyon" and "Number 46: Dragluon" destroyed each other and Jinlon revealed his true past life, Mizar reverted back to his human form. He then angrily Battlemorphed back to his Barian form, affirming that he will not believe that "Tachyon Dragon" would betray him and he will defeat Kite.. Mizar and Kite continued the Duel, with the former brutally assaulting Kite, which caused him and Orbital 7 to sustain severe damage. While Kite lay on the ground, exhausted, he made a connection with Yuma, Astral and Tori Meadows so they could watch the Duel. At this point, Kite and his friends asked Mizar to cease fighting for Don Thousand, who had been manipulating him, but Mizar quickly claimed that he was fighting to protect his fellow Barians. Yuma and Astral told him that there was nobody to protect because Vector betrayed and absorbed most of his companions. They also confirmed that "Neo Tachyon" was Don Thousand's curse upon him, much to Mizar's horror and disbelief. Kite cut the conversation short, claiming he will free Mizar from his curse, and the two resumed their Duel. Mizar sobs at his rival's demise. Kite brought back "Number 62: Galaxy-Eyes Prime Photon Dragon" to battle with "Neo Tachyon". As the monsters clashed, Kite questioned Mizar on why he was a dragon tamer and theorized that he trusted dragons but was incapable of trusting people. Mizar demanded Kite to not take pity on him. Kite quickly claimed it was not pity, but admiration, since he recognized Mizar as the true Dragon Master. Kite further clarified that he just used his "Galaxy-Eyes" because he wanted to protect his family, but his monster allowed him to meet all his friends and trust people. Kite asked Mizar to tell him that the next time they met to tell him what happened to him. He activated the effect of "Prime Photon Dragon" and defeated Mizar. Mizar witnessed the awakening of "Number 100: Numeron Dragon" and walked towards Kite, who lay beaten on the ground. Kite gave "Numeron Dragon" to Mizar, asking him to walk the path he believed in, before dying as a result of his injuries. Mizar mourned for Kite and angrily swore revenge on Don Thousand. Though he had lost the ability to use his "Over-Hundred Number" and take Barian form, Mizar was still able to travel back to the Barian World, intent on confronting Don Thousand. Upon arriving, he gave "Numeron Dragon" to Yuma and then challenged Don Thousand. The two Dueled, but Thousand used "Numeron Network" to manipulate the Duel, resulting in Mizar performing a One Turn Kill on himself with "Card of the Dragon King" in lieu of drawing the Duel with "Dragon King's Demise". Before dying, he urged Nash and Yuma not to allow the sacrifices of everyone to be vain and defeat Thousand. Mizar's spirit appears with Nash. During Nash's Duel with Yuma, Mizar's soul appeared to support Nash alongside those of the other Emperors after Nash overlaid their "Chaos Over-Hundred Numbers" to create "CXyz Barian Hope". Mizar at Heartland Academy as a third year student. After Astral obtained the Numeron Code, Mizar was brought back to life as a human, alongside his fellow Barian Emperors. Mizar enrolled into Heartland Academy as a third-year student. He then joined Yuma in coming to Astral's aid when the Astral World faced a new crisis. Mizar with his "Over-Hundred Number" and its upgraded form. Mizar's "Over-Hundred Number" is "Number 107: Galaxy-Eyes Tachyon Dragon", with its upgraded "Chaos" form being "Number C107: Neo Galaxy-Eyes Tachyon Dragon". Mizar acquired "Number 6: Chronomaly Atlandis" and "Number 33: Chronomaly Machu Mech" from Trey and "Number 9: Dyson Sphere" from Quinton after defeating them. This may have also netted him the upgraded forms of two of them "Number C6: Chronomaly Chaos Atlandis" and "Number C9: Chaos Dyson Sphere". After losing to Kite, which resulted in the latter's death, Mizar acquired "Number 100: Numeron Dragon", along with "Number 62: Galaxy-Eyes Prime Photon Dragon" and "Number 46: Dragluon". He later gave "Numeron Dragon" to Yuma. His remaining "Numbers" were taken by Thousand when the latter absorbed him. As Kite and Mizar wield "Galaxy-Eyes" monsters, they share a fierce rivalry with one another. Both are determined to defeat one another in a Duel to find out who the true "Galaxy-Eyes" master is. During their third Duel, Kite attempted to show Mizar his true identity through "Number 46: Dragluon", but Mizar continuously ignored it. Mizar later mourned Kite's death after their Duel and accepted "Number 100: Numeron Dragon" from him before he passed on, and swore revenge against Don Thousand to avenge his rival. After their revival, the two became allies with Yuma in his fight to save the Astral World. Mizar uses a "Tachyon Dragon" Deck, focusing on his ace card, "Number 107: Galaxy-Eyes Tachyon Dragon", Summoned using Dragon-Type monsters that can either Special Summon themselves or modify their Levels to 8. Once it is Summoned, he focuses on replenishing its Overlay Units through cards such as "Energy Attractor" and "Instant Overlay". He later gains access to "Rank-Up-Magic - The Seventh One" through the Chaos Draw, allowing him to Rank-Up "Tachyon Dragon" from his Graveyard or Extra Deck. Mizar can also utilize "Galaxy Stealth Dragon" along with "Dragon King's Demise" in an attempt to perform a One Turn Kill. Mizar, along with Alito and Girag are the only Barian Emperors not connected to each other in their original human lives, unlike the other 4. ↑ 1.0 1.1 1.2 1.3 Yu-Gi-Oh! ZEXAL episode 128: "Settling the Score, Part 2"
↑ 2.0 2.1 2.2 Yu-Gi-Oh! ZEXAL episode 124: "Battle with the Barians"
↑ 3.0 3.1 3.2 Yu-Gi-Oh! ZEXAL episode 127: "Settling the Score, Part 1"
↑ Calculated from "Zexal Height Guide". http://41.media.tumblr.com/b2444bcced08050fb52ac592ebb92f0f/tumblr_mt1no4TWqL1sitde3o1_r1_1280.png. and "Main Character Comparison Sheet". http://40.media.tumblr.com/536927e46afc80f3421681c5b566354a/tumblr_n37ishvPTv1sitde3o1_1280.png. ↑ 5.0 5.1 Yu-Gi-Oh! ZEXAL episode 99: "A Duel in Ruins: Part I"
↑ 6.0 6.1 6.2 Yu-Gi-Oh! ZEXAL episode 83: "Sphere Cube Calamity: Part 2"
↑ 7.0 7.1 7.2 7.3 Yu-Gi-Oh! ZEXAL episode 82: "Sphere Cube Calamity: Part 1"
↑ 8.0 8.1 8.2 8.3 8.4 8.5 8.6 Yu-Gi-Oh! ZEXAL episode 135: "Dragon Strife, Part 2"
↑ 9.0 9.1 Yu-Gi-Oh! ZEXAL episode 87: "Dual Duel: Part 1"
↑ 10.0 10.1 Yu-Gi-Oh! ZEXAL episode 94: "Enter Vector"
↑ 11.0 11.1 Yu-Gi-Oh! ZEXAL episode 96: "Shadows of Deception"
↑ 12.0 12.1 12.2 12.3 Yu-Gi-Oh! ZEXAL episode 106: "Put to the Test: Part 2"
↑ 13.0 13.1 Yu-Gi-Oh! ZEXAL episode 133: "Vector the Victor"
↑ 14.0 14.1 Yu-Gi-Oh! ZEXAL episode 134: "Dragon Strife, Part 1"
↑ Yu-Gi-Oh! ZEXAL episode 129: "Fists of Fury, Part 1"
↑ Yu-Gi-Oh! ZEXAL episode 74: "Attack of the Barians: Part 1"
↑ Yu-Gi-Oh! ZEXAL episode 80: "Rivals in the Ring"
↑ Yu-Gi-Oh! ZEXAL episode 95: "The Search for Shadows"
↑ Yu-Gi-Oh! ZEXAL episode 97: "Sinister Shadows"
↑ Yu-Gi-Oh! ZEXAL episode 98: "Shadows End"
↑ Yu-Gi-Oh! ZEXAL episode 103: "Barian Vengeance: Part 1"
↑ Yu-Gi-Oh! ZEXAL episode 105: "Put to the Test: Part 1"
↑ Yu-Gi-Oh! ZEXAL episode 108: "A Sea of Troubles: Part 1"
↑ Yu-Gi-Oh! ZEXAL episode 118: "Mission: Astral World, Part 1"
↑ Yu-Gi-Oh! ZEXAL episode 122: "Assimilation, Part 1"
↑ Yu-Gi-Oh! ZEXAL episode 123: "Assimilation, Part 2"
↑ Yu-Gi-Oh! ZEXAL episode 125: "Fight for a Friend"
↑ Yu-Gi-Oh! ZEXAL episode 126: "Farewell for a Friend"
↑ 29.0 29.1 29.2 Yu-Gi-Oh! ZEXAL episode 138: "The New World"
↑ Yu-Gi-Oh! ZEXAL episode 142: "The Battle of Three Worlds"
↑ Yu-Gi-Oh! ZEXAL episode 146: "Forever ZEXAL"
↑ Mizar noted this card is in his possession in episode 96. Aim For Number 1 in the World!